The thesaurus doesn’t include an antonym for the word ‘titans,’ so it’s hard to describe the battle that took place Thursday night, featuring SFU’s women’s soccer team, ranked seventh in the conference, falling to the sixth place Northwest Nazarene Crusaders (NNU) by a score of 2-0. Despite their less-than-stellar records, the game featured its fair share of exciting moments from both sides. The Crusaders were in control of the match right from the early stages, dominating possession and forcing SFU freshman keeper Priya Sandhu to make several big saves. 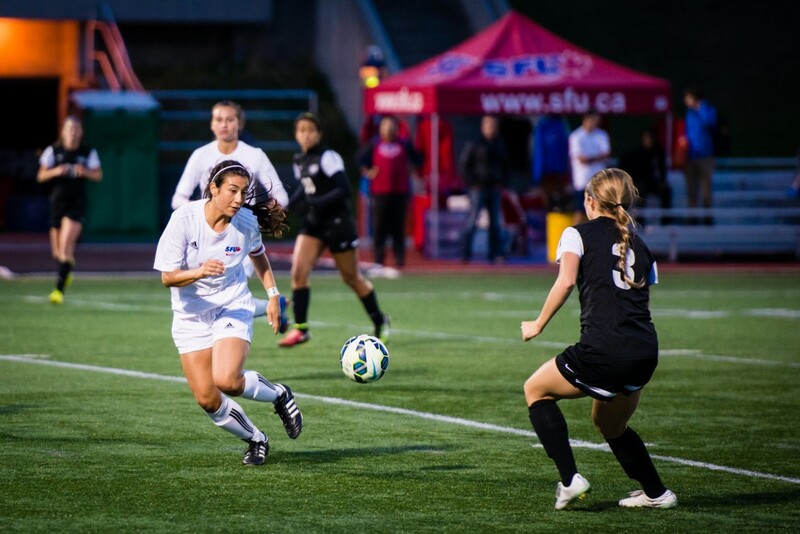 Despite being outplayed in the opening 45 minutes, SFU almost caught a break at the 42nd minute when forward Olivia Aguiar received a long pass and beat two defenders almost leading to a breakaway. Unfortunately, she couldn’t find a path to the net, and the two teams ended what was a relatively uneventful half still deadlocked at 0-0. Sandhu continued her sharp play at the beginning of the second half with a monster stop on a header from NNU midfielder Laura Seymour in the 49th minute. 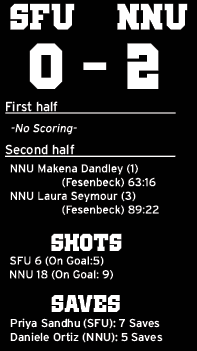 After sustaining a long stretch of pressure around the SFU goal, the Crusaders finally broke through in the 63rd minute, when forward Lexi Fesenbeck’s corner connected with the head of defender Makena Dandley and sailed into the back of the net. The goal was a huge blow to the Clan’s hopes and ended Sandhu’s chances at a clean sheet. “It’s disappointing especially being on a set piece,” Sandhu said, adding that this is something that they will definitely work on in practice. From that point on, SFU couldn’t generate much attack and, despite one crowd member’s high volume insistence that “you can do it,” the girls were unable to threaten NNU’s lead. Adding insult to injury, the Crusaders doubled their lead in the last minute of play following a questionable non-call and sent the Clan off the pitch on a particularly sour note. Despite losing their fifth straight game to what was most likely a beatable opponent, the Clan have not lost faith and believe that they will still be competitive going forward.